At 18, Tré gave her newborn daughter up for adoption. At 19, her only sibling was killed in a car crash. At 34, she lost her husband to a sudden heart attack. But at 36, her teenage daughter found her on Facebook and began to reshape the course of Tré’s life. The sum of these milestones is Splitting the Difference: A Heart-Shaped Memoir, a nonfiction work that is equal parts inspiring, irreverent and heart-rending. In sharply immediate prose, Tré unpacks her experience of being young and widowed in New York City: the “dumb sh*% people say”; the “brave face” she wears to work or social events; and the lack of solace in one-night stands. Her perspective only begins shifting when she spontaneously brings Alberto’s ashes on a trip and sets into motion the ritual of spreading him in bodies of water around the world. By traveling to bucket list destinations like Brazil and Cuba, Tré discovers a strategy for facing her roughest days. Alberto’s loss becomes a portal through which Tré views her past and embraces her future: she quits her corporate job, explores her husband’s homeland of Cuba and joyfully reunites with her biological daughter in North Carolina. 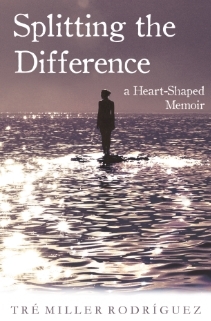 A deeply moving narrative, Splitting the Difference is written with the “raw-thenticity” of a woman transformed by heartbreak and inspired by love’s legacy.